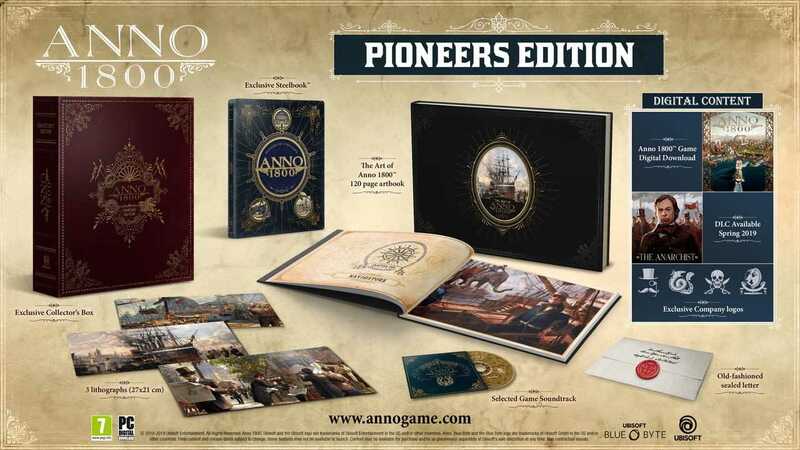 The Art of Anno 1800: Fully enjoy the world of Anno 1800 with this 120-page Artbook featuring the stunning artworks created by Ubisoft Blue Byte Studio Mainz during the development of the game. The Anarchist DLC: Meet the Anarchist Dr. Hugo Mercier and decide whether he will become a powerful ally or a dangerous opponent. This new character comes with new quests and new items. Dr. Hugo Mercier also brings a new player portrait and a new company logo for you to customize your profile. Available Spring 2019. Copyright © 2014 - 2019 SocksCap64, All Rights Reserved. Logos, Trademarks, Pictures Belongs To Their Respected Owners. Powered By WordPress. 101 Queries in 0.547 seconds.